Yeah, really good to hear as it’s appeated to be quite a challenge for not only those coming over from Iris but for the Hubitat support crew and the forum members, having a sudden influx of new users. The community is outstanding. I try to post anytime I work something out to also make it easy for others to fix their issues even faster. One small suggestion for improving the HE experience would be that I think it would be nice to have tutorials on how to setup devices already in place so they can come up when someone who migrates can find them easily. I realize it might not be feasible given the large pool of hardware HE supports, but it was a bit disconcerting at first searching for guides that apparently are not available (and if they are, they should be easier to find). Regardless, the community has so far come through 100% of the time, including the HE folks themselves who often chime in with suggestions and updates, so I can't really complain. Has anyone paired up the Iris Range Extenders? I was able to exclude and then pair the Z-Wave portion of the extender, but I think these also have a Zigbee portion. HE now has separate buttons for pairing Iris V1 Zigbee devices and for standard Zigbee HA devices. I tried both, but nothing showed up. Maybe I'm not resetting the extender properly. I plugged it in and hit the button 8 times to reset it for the Z-Wave pairing, and pressing the button once seemed to cause it to exclude or to pair on the Z-Wave side. Which model iris range extender? If it’s The big square plug, You put the HE in regular Zigbee pairing mode and hold the buttons while plugging the plug in and then release the button when the light starts to come on it should find the Zigbee plug. Zigbee portion operates the outlet. Zwave portion works as a repeater and you do it by the pushing of the button 8 or 10 times. HE now has separate buttons for pairing Iris V1 Zigbee devices and for standard Zigbee HA devices. @srwhite related to this question, how will we now pair both the zigbee and zwave pieces of those Iris 3210-L smart plugs since your excelant instructions don't work after this HE change to the pairing process? It’s a REP800. It’s shaped just like the gen1 plugs, but no big button. There is a tiny hole with LED, and it’s actually also a tiny button which requires a toothpick or something to press. I might try holding it down while plugging in and see what happens. The only thing that changed was the button you push in Hubitat to start the pairing process. For the 3210-L/L2 plugs you need to use the Zigbee button for the SmartPlug, and Z-Wave for the repeater. Otherwise all of the steps work as it did in the past. Previously pairing of both happened at once after doing the complete reset. Now, when you do the reset and jump into zigbee pairing mode and that process is complete, there is nothing that seems to start the zwave pairing process on that device. @srwhite Have you tried this yourself since the change was made to this new paring process. If so what specific steps did you take as soon as the zigbee pair happened to go ahead and pair that device's zwave side? So for my questions ....Thanks everyone for the info on cameras and battery backup suggestions. I bought an EasyACC power bank from Amazon to act as an UPS. It has pass-through charging and doesn't interrupt power to the HUB when the charging cables are removed. Anyone have any more ideas/input on #1, 2, 3, 5, or 6? Thanks to @thekidb for cluing me in how to best make #4 happen using rule machine. Super happy about having this capability again. It's been on my wish list ever since having to give up the IRIS Gen1 Hub. I only had to create one rule to "Cancel Alerts". I tested it out and it works like a champ! 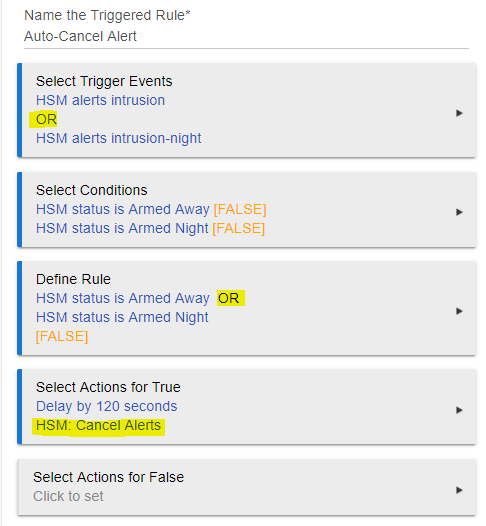 Even if the device that triggered the intrusion alarm is still open after auto-cancelling the alert, HSM will still be armed and will trigger for any other intrusion event including the device that was opened if it is subsequently closed and re-opened. Here is the screenshot of the rule I created. Hope this helps someone else. I did the same thing by just cancelling the alerts. I think the system stays armed the whole time, and you can do it with one rule. I also noticed that the "violated" sensors are disregarded after alerts are cancelled. Okay, just got my new hub due to Iris v1 support, and easily set up three v1 outlets that work fine. But I cannot get v1 contact or motion sensors to pair, all factory reset. What am I missing? Thanks! Welcome! Love this platform as a replacement for Iris. I have just done a lot of my migration. All of my contact sensors are v1. To reset I pulled the battery for 10 seconds, on reinstall of the battery, bush the reset button 8 times. some had to be within a few feet of the hub. This worked with all of my contact sensors. What motion sensor, v1 or v2? I only have v2. All my devices are v1, and I have done the proper resets you described. The devices go into pairing mode, and I use the Iris v1 ZigBee button, but the hub just will not find them. I have also restarted the hub, powered it off, etc., still nothing. Kind of frustrating after a good start with the smart plugs. Also, I'm pairing devices within arm's reach of the hub, so not a distance problem. I was away for a couple of weeks and I'm now finally able to update the original post with this GREAT NEWS! I had the same issue with 2 v1 contact sensors. One battery was low and a new battery helped. A new battery did not help the other. I noticed that neither sensors light would work when pressing button to reset I thought it was just broken and ordered a different sensor to replace. After leaving battery out for a while, I tried again and it worked to reset and paired. Probably a fluke but worth a shot for you. I had the same issue with 2 v1 contact sensors. "One battery was low and a new battery helped. A new battery did not help the other. I noticed that neither sensors light would work when pressing button to reset I thought it was just broken and ordered a different sensor to replace. " Same thing happened to me with my gate v1 sensors when I tried to pair them. I just used new ones since I grabbed a few off of ebay. I don't know if this will help you and you may have even tried it but if you put the app in pairing mode before putting the device in pairing mode that has worked for me with some stubborn devices. You might also want to try resetting the device even if you already did it before. I've had devices that were stubborn but I kept at it and eventually I got them all paired. The worst was a Utilitech siren. I have two. The older one paired almost instantly. The newer one probably took 10 times before it finally paired. I had the same sort of problem with a IKEA plug but persistance and trying different things eventually paid off. I've had similar issues with some V1 devices. What worked for me was installing new batteries. It appears that some batteries drained unusually fast after taking the hub down. I hope this helps. Received my HE last week and converted my Iris v1 and 3rd party devices over. Thus far I'm very impressed with the APPs and associated functions. I had Iris for several years and wasn't really hopeful that all would work but was pleasantly surprised. The local HE control was super fast in response but the Cloud portal access lags somewhat. The Rules and other APPs are even more versatile that Iris had, bu they do require some time to get familiar with the configuration differences. I have the following devices working now: three Iris v1 motion sensors, several Iris v1 contact sensors, two First Alert Smoke detectors (ZCOMBO), Iris v1 outets, three GE Z-Wave Plus In-Wall Smart Dimmers, Radio CT101 Thermostat, Honeywell thermostat, and Iris Water Sensor. The Iris v1 Keypad (alertme) is associated to the Hubitat but there isn't a device driver that provides any functionality. Does anyone know if Hubitat is committing resources to develop such a driver? This could provide both a security keypad and siren if support is added. Also my newer Iris WiFi Smart Outlets (IRIS-WSP1PA-LW) aren't supported. They were made to use the Iris App to configure via WiFi and then communicate to the hub via Zigbee. Does anyone know if there are plans to interface HE to these units? Here are a few lessens learned from the conversion. (1) I had problems pairing some Z-wave and Zigbee devices until I moved them within a few feet of the Hub. After pairing, they worked fine to move them to their original locations. For example, I had to relocate my Hub near the CT101 Thermostat (since thermostat was hardwired in) to get it to pair. (2) Plan to perform a 'reset' on devices that don't pair initially. Many of the Iris branded equipment took pressing a reset button 8 times and then retrying the pair. The CT101 required holding the 'mate' icon for 25 seconds. The GE switches had to be pressed 'on' 8 times. The First Alert Smoke detectors were the most problematic. I found that rebooting the HE and then retrying a reset of the devices did the trick. (3) I'm playing with using a ChromeCast to generate a 'siren' for audible alerts. Haven't gotten it to work yet though. Thanks to the Hubitat team for making the conversion affordable and relatively easy for us former Iris users!